This post is written by Nick Dekker, blogger at Breakfast with Nick and author of a book all about breakfast in Columbus. You can follow him on Twitter @BreakfastwNick. What’s better than dinner and show? Downtown Columbus hosts a wide range of live entertainment, between local theater companies at the Riffe Center to touring Broadway shows at the Palace, Ohio, or Southern, to great concerts at the Lincoln. Hoping to make a night of it? Check out these spots for dinner and drinks before or after the theater. If burgers and a drink are your thing, you have two options down Lynn and Pearl Alleys. Oliver’s serves up burgers, sandwiches, and steaks. Find a cushy booth in the long, brick-walled restaurant, and pair your meal with their handsome bourbon selection. Nearby the boxing-themed Ringside Cafe serves cold draft beer to go with their hefty burgers, all named after famous boxers. Tip Top Kitchen & Cocktails serves Ohio comfort foods like tender pot roast, creamy mac and cheese, and rich meatloaf, all to go with a great selection of Ohio beers and inexpensive cocktails. 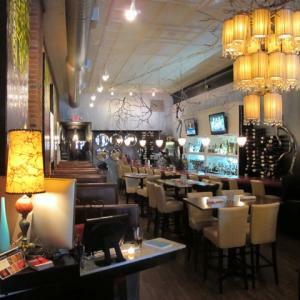 For something a little more elegant, look into Due Amici or de-NOVO bistro and bar. Due Amici serves a superior wine list in a comfortable atmosphere to go with their modern Italian fare. Enjoy stuffed ravioli, house-made pizzas, and entrees like pan-seared walleye. De-NOVO features a range of meats in their entrees, from duck to rabbit, from lobster to sea bass. And their eclectic decorations can’t be beat! Dempsey’s Restaurant serves pub classics like sandwiches, steaks, and lobster pot pie. Catch their weekday happy hour for a drink or two before the show. Elevator Brewery and Draught Haus is located in a 100-year-old building with beautiful tiled floors and a long wooden bar. Sip one of their house brews while you enjoy fish & chips or surf & turf served sizzling on a hot rock. Milestone 229 offers beautiful views of the Scioto River and the Columbus skyline to go with their crab cakes, schnitzel, and pizzas. A short walk north of Capitol Square you can find delicious eats like sushi and ramen at Rishi Sushi, or beef & lamb burgers and microbrews at Wolf’s Ridge Brewing. There’s always more to discover downtown! What are your favorite stops before or after a show?